Events — The Scrap Tire Research and Education Foundation, Inc. 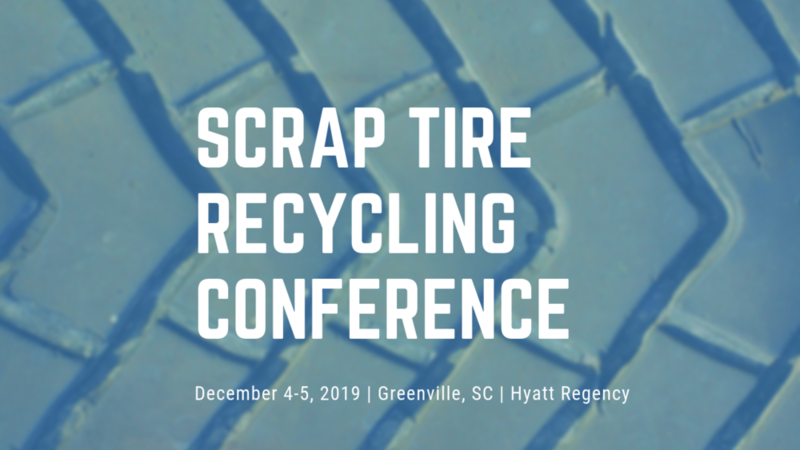 The Scrap Tire Research and Education Foundation, Inc. (STREF), the U.S. Tire Manufacturers Association (USTMA) and the South Carolina Department of Commerce are proud to host the 8th Scrap Tire Recycling Conference on December 4-5, 2019 in Greenville, South Carolina. As the scrap tire industry’s premier market development and emerging trends conference, the 8th Scrap Tire Recycling Conference offers a valuable opportunity for industry leaders, regulators and stakeholders to review key developments in scrap tire management. This year, we will explore emerging trends in circular economy and scrap tires, and explore challenges and opportunities for existing and potential markets for scrap tires including: rubber modified asphalt, micronized rubber powder, tire-derived fuel, civil engineering markets and emerging markets like pyrolysis and devulcanization. The Scrap Tire Recycling Conference has been the scrap tire industry's top event for the past decade. Make your plans now to join hundreds of your colleagues in Greenville, SC, to discuss the important scrap tire issues facing the industry. Information about the Conference Agenda will be available soon. Sponsoring at a STREF Conference is a great way to increase your company’s recognition in the Scrap Tire Industry. Companies or organizations can support the 8th Scrap Tire Recycling Conference by becoming a Bronze, Bronze Plus, Silver, Gold or Green Sustaining sponsor. Sponsorship Packages are available to showcase the products, services and technologies offered by companies and organizations with an interest in the use of ground rubber in higher-value added applications. Click here to learn how to become a sponsor for the 8th Scrap Tire Recycling Conference or contact John Sheerin at 202.682.4838 or jsheerin@ustires.org. Exhibitor opportunities are available for the 8th Scrap Tire Recycling Conference. The exhibitor fee of $1000 entitles each participating organization to one conference registration and a six (6) foot draped table in an area immediately adjacent to the main meeting room where beverages will be available during the morning and afternoon breaks. Discounted additional registrations are available for Exhibitors. Exhibit space can be reserved by using the online registration service. Our host hotel, the Hyatt Regency in downtown Greenville is offering a SPECIAL EARLY BIRD CONFERENCE RATE of $139 per night for a limited number of Scrap Tire Recycling Conference attendees. Similarly the Hyatt is offering a limited number of GOVERNMENT ROOM RATES at $94 per night. Although the deadline to receive this special rate is November 11, 2019, we strongly recommend making your reservation as soon as possible. When calling, please identify yourself as members of the Scrap to Profit Conference. Please Note: Hotel room rates are subject to applicable state and local taxes (currently 10% plus $2% destination fee per room per night) in effect at the time of check-out. In order to receive the government rate, a valid government photo ID is required at the time of check-in.